The overall fit of these pants is kind of trim (not baggy like some). The waist is elastic so there is some “give” with respect to fit. We measured each size with the waist “not stretched” and then “fully stretched”. My advice would be to choose a pant size where your measured waist over clothes falls in the middle of the range. 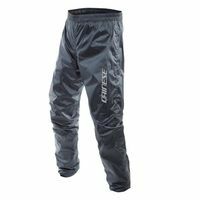 Dainese says: Ultra-lightweight, packable and waterproof are the perfect match for rainy days in the Dainese Rain Pants. 100% waterproof material with an elasticated waist and adjustable leg bottom combine with a modern cut for superior fit. Easy-on/easy-off convenience from a 100% waterproof zipper up to the knee.